16-year-old Starr Carter lives in two different worlds as she maneuvers between her home and neighborhood and the private prep school she attends where she works hard to be "less ghetto". It's difficult separating herself out like that and, after one of her childhood friends is shot in front of her by a police officer, her balancing act starts to crumble. Through Starr's eyes we are able to experience what many young people are frustrated with today; police brutality and rampant racism. Starr has a family that supports her, parents that are involved in her education and teaching her what's right. We can see through her father and his friends how hard it is to make good decisions when you have people inviting you to do bad everyday. Her family has been witness to a lot of tragedy and just like other families they keep moving forward even though the journey is trying. I loved the language, the cadence of listening to Starr speak in both voices. "I swallow. I wish I could say yes, but I don't know. On the one hand, it's the cops. It's not like I'll be telling just anybody. On the other hand, it's the cops. One of them killed Khalil. But Uncle Carlos is a cop, and he wouldn't ask me to do something that would hurt me. 'Will it get Khalil justice?' I ask. "The drug dealer. That's how they see him. It doesn't matter that he's suspected of doing it. 'Drug Dealer' is louder than 'suspected' ever will be. "Salt-N-Pepa's "Push It" blasts from the speakers. That's one song Daddy shouldn't play. The only thing worse would be that old song "Back that Thang Up." Momma loses her damn mind when it comes on. Really, just say, "Cash Money Records takin' over for the '99 and the 2000," and she suddenly becomes ratchet as hell. This is an important YA story that adults should read as well. 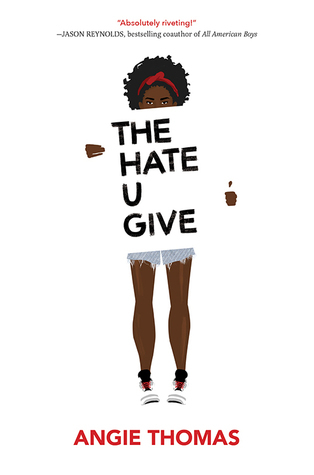 I am excited to read what ever Angie Thomas writes next. March has blown in and surrounds me now.